Over the weekend, a "concerned fan" expressed to Janelle Monáe via Twitter that they wanted her to stop being "so soulful" and to be "sexier" instead, adding in that the "dumbass suits" she often sports needed to go into the trash bin ages ago. With this glorious clapback, the visual for Monáe's latest single, "Yoga", shoehorns in at a brilliant time as it addresses exactly why bottom feeding tweet like this continue to bring the eye-rolls. "Yoga" surprised many as it colored out of the lines of the singer's usual afro punk-funk repertoire, but once you drew back the curtain of trappy synth beats and the snap n' crackle of her purr, the song revealed itself as an anthem still fully in line with Monáe's mantra about being completely unapologetic when reveling in the joy of self. 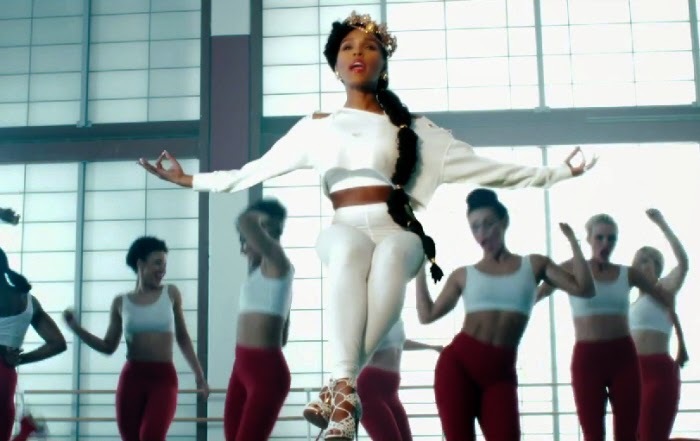 The visual for "Yoga" continues to follow through with this message as Monáe, along with her troop of aerobic dames, celebrate their curves as they send out some supreme and inspiring body language while getting their flex on in a spacious loft. Monáe even takes some time to channel her Janet Jackson "Pleasure Principle"-esque mirror preen, soaking in the love and tight dance moves that reflect back at her. After some zen moments of levitation, Monáe and her troop take the body party to a diner, joining up with song's co-star Jidenna for a rousing finale where everybody is bending over and doing that yoga. Though some believe "Yoga" is priming Monáe to stylistically "sell-out", the former saddle shoe hi-stepper doesn't really care, and it's why I love her for this. This visual affirms with each and every flex that her body is her 'wondaland', her temple, and that thieves dare not enter it unless it is with her permission. You can gaze and marvel all you want, but Monáe's not showing it off for you, your friends, your fake Instagram followers, or your Auntie Lulu, she's doing it because she's her own private dancer, and to express and share her own personal brand of womanhood is what makes her happiest of all. For those who don't see or hear that and want Monáe to either don her android suit again or be even sexier...I feel a bit sorry for you.